I have admit that when it comes to the Big Two, I'm more a DC Comics dude. But I'm also very much willing to admit when they're messing up in the movie game. The fact that Marvel has garnered enough goodwill to try to pull something as nuts as GUARDIANS OF THE GALAXY is a testament to how well they have built their movie universe and their reputation . This is currently the only movie that I'm really looking forward in the summer. Check it out below. Getting off the Chris Pratt/LEGO MOVIE high, this trailer just hit all of the right notes. Especially since this is a comic book property no one beyond nerds actually care about until the movie was announced. Also, it has a decidedly less gloom and doom tone that the last few Marvel movies have had. Either way I can't wait to see more of Rocket Raccoon and Groot. It's obvious they'll be stealing the show. 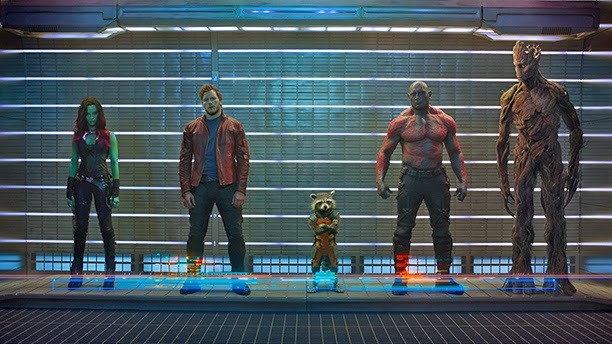 THE GUARDIANS OF THE GALAXY is directed by James Gunn, it stars Chris Pratt, Zoe Saldana, Benicio Del Toro, Karen Gillian, Dave Bautista, Bradley Cooper and Vin Diesel, it comes out August 1st, 2014.